ANTALYA, Turkey -- NATO leaders on Wednesday warned President Vladimir Putin to waste no time in implementing a fragile peace deal to end the fighting in Ukraine, after the Russian strongman's meeting with US Secretary of State John Kerry raised hopes of a slackening in tensions. A TV journalist prepares to do a piece to camera in front of a tank on the frontline between Ukrainian forces and pro-Russian separatists near Debaltseve, east Ukraine. He said there was an "enormous moment of opportunity" to bring to an end over a year of fighting in eastern Ukraine between government forces and pro-Russia separatists which has dragged relations between Moscow and the West to a new post-Cold War low. "I think there was strong agreement among all of the NATO members that this is a critical moment for action by Russia, by the separatists, to live up to the Minsk agreement." 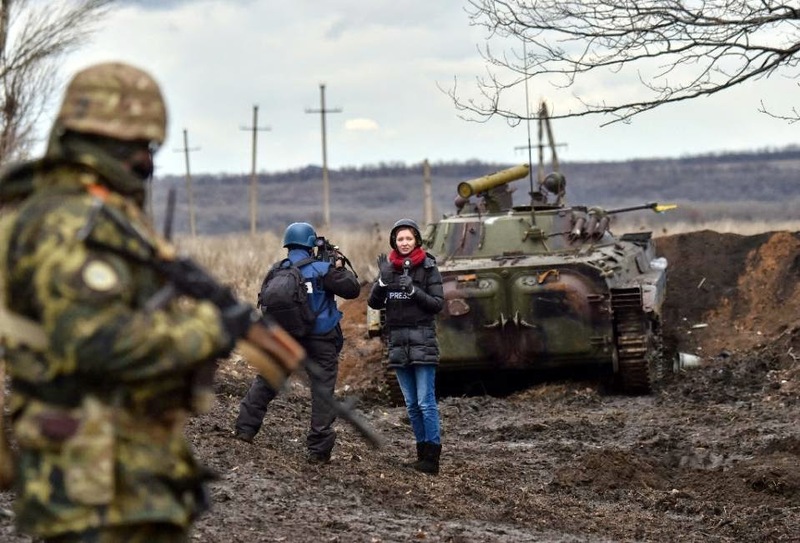 He added that it was also "critical" for observers from the Organization for Security and Cooperation in Europe (OSCE) to be allowed into the conflict areas to monitor the truce. The intensity of the fighting in eastern Ukraine controlled by pro-Russia separatists has declined since the Minsk deal but deadly clashes remain frequent. Kerry met Putin on Tuesday for the highest level US visit to Russia since the Ukraine conflict erupted in 2013, in a possible sign of a cautious thaw between the two sides. The talks lasted for four hours and even though there was no concrete breakthrough, Russian Foreign Minister Sergei Lavrov had said that the talks helped the two sides to "better understand each other". Kerry said in Antalya the United States and its NATO allies would prefer not to keep sanctions in place against Russia but would retain the measures in order to ensure peace in Ukraine. "This is an enormous moment of opportunity for the conflict... to find a path of certainty and resolution," said Kerry, who earlier met with Ukrainian Foreign Minister Pavlo Klimkin. "And we hope very, very much that President Putin, Russia, the separatists, will come together to work with Ukraine in order to fully implement it (Minsk) and make progress," said Kerry. Klimkin said he was "not worried at all" by Kerry's talks with Putin. "I am completely 100 percent convinced that the US will follow its strategic interest and goal and this is to support independent Ukraine," he said. NATO Secretary General Jens Stoltenberg warned Russia that it has to immediately halt its support of the separatists and withdraw heavy weaponry from the conflict zone, as other officials expressed doubt about Moscow's sincerity. "Actions speak louder than words," Stoltenberg said. "Now is the time to act... there is urgency when it comes to fulfilling the Minsk agreement," he said. Stoltenberg said the ceasefire was "ever more fragile". A statement after a meeting of the NATO-Ukraine Commission in the afternoon said there continued to be ceasefire violations "primarily by Russian-backed separatists". It accused Moscow of "continued support" for the separatists, "including the transfer of weapons". The statement also expressed concern over a "wide-ranging" military build-up by Russia in Crimea, as well as talk Moscow could even install nuclear weapons on the annexed Black Sea peninsula. The NATO ministers are meeting for two days in the Turkish resort city, the first time since 2011 that such a meeting is being held outside Brussels. However, Kerry left early to attend a summit of Gulf leaders hosted by President Barack Obama. The West accuses Russia of arming separatists in eastern Ukraine and even sending its own troops across the border. Russia, as allways, denies the charges. German Foreign Minister Frank-Walter Steinmeier denied that a "turning point" had been reached with the Kerry-Putin meeting, saying there were still numerous obstacles in the way. "We have to expect that it will stay a long, protracted and difficult process." In Berlin, German Chancellor Angela Merkel, who last Sunday met Putin in Moscow, said that in Ukraine "we are not yet where we want to be... we don't yet have a complete ceasefire", speaking alongside visiting Ukrainian President Petro Poroshenko.